Take M-32 east out of Hillman. From State Street, go 3.8 miles and turn right on Jack’s Landing Road. In another 5 miles or so, definitely not as the crow flies, you’ll be at one of the premier bass fishing floodings in the United States: Fletcher Pond. 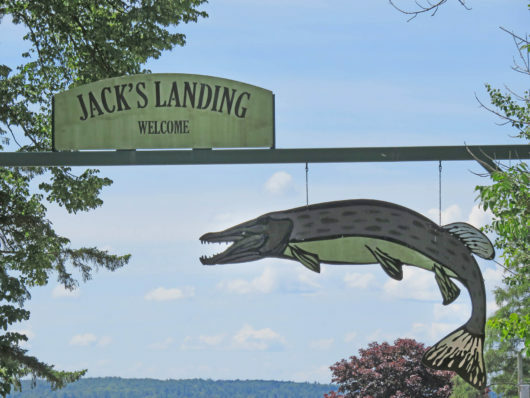 And Jack’s Landing Resort (“Cast out your vacation line”) is the gateway to a wonderful bass fishing adventure. A bit more on Fletcher Pond in a bit, but this post is mostly about getting to Jack’s Landing. 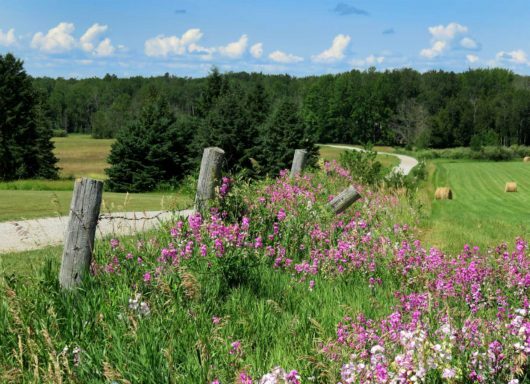 In mid-July the road to Jack’s Landing is enough to set your every allergy ‘ablazing. 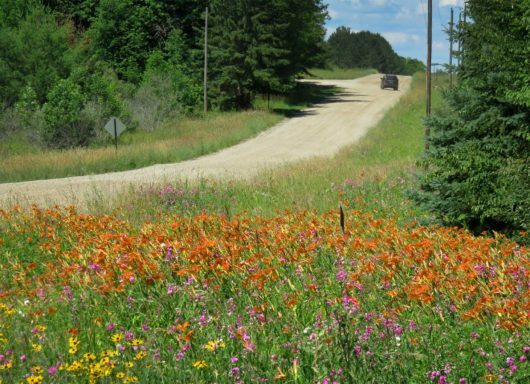 This road is making the pollinators very happy indeed. One farm in particular is a do-not-miss. 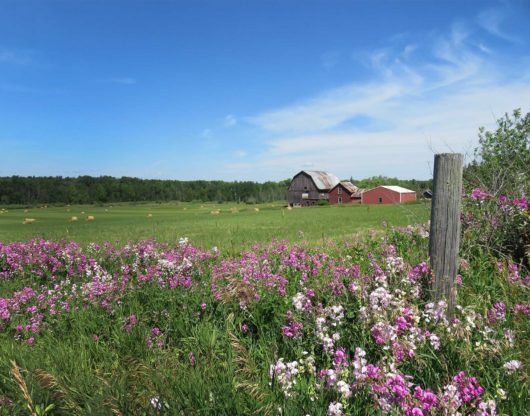 The fence rows are filled with Everlasting Pea. It’s a native European plant, lathyrus latifolius, and it’s taken to our neck of the woods in a big way. Everlasting Pea, also known as Perennial Pea, is a rhizome. It spreads with deep roots and forms a dense viney mat. But, if support presents itself, it can grow to 5-7 feet. In the background are big cylindrical hay bales just recently mowed. Montmorency County, Michigan, can be a study in contrasts. That long winding road looks like it would lead to some peaceful pristine spot. Not quite. There’s a very sturdy metal gate across the road just beyond these fenceposts. And something that looked like chemistry and drilling seems to be going on where the road winds to the left. 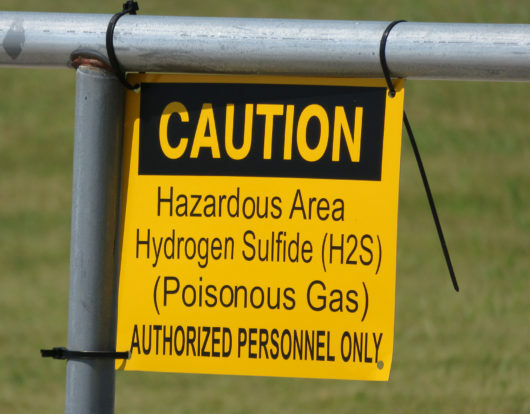 Hydrogen Sulfide. It’s a gas that’s heavier than air, very poisonous, corrosive, flammable, and explosive. Wow. I guess we’re lucky that it also smells like rotten eggs, so at least we will know if it’s released. We smelled nothing in the area that didn’t smell like it belonged, though. Someone is spending a lot of time tending their piece of the planet. So, so pretty. Keep your eyes peeled after you pass this garden paradise. On the right, you’ll find this 12-foot long conversation piece. Today it was just after some big long black tire skid marks in the road. There must be an interesting story to this. I don’t know it. 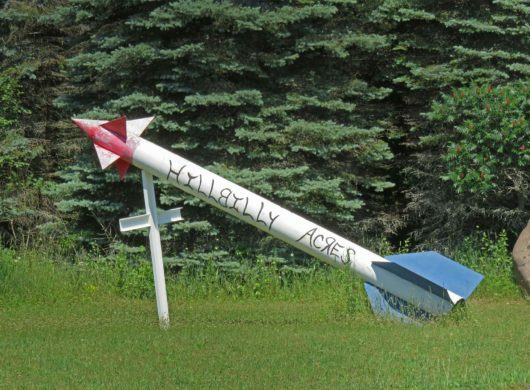 Our local rocket has been leaning at this angle for many years. Guarding something. Maybe. Pointing to something. Maybe. Let’s get this back to the sublime. Here’s another winding road on the way to Jack’s Landing. I’m not sure what that yellow guy hiding in the background is. I didn’t notice it until Steve finalized the photo. Even the foliage is beautiful. About that daylily, Old Orange Daylily a/k/a hemerocallis fulva. Daylilies like these that are not true lilies (partly because they don’t grow from bulbs) have been cultivated in many varieties and colors. But these are one of the early cultivars. They are not wild, but since so many of them are growing by the side of roads, they might as well be. They aren’t native plants, but they were an early arrival. As the story goes, they traveled from the East along with settlers. Before that they traveled from Asia. They grow from a mass of roots and are so hardy they apparently got thrown in the backs of wagon and were planted and divided again and again among many generations of American gardeners. They are all over the country now. And Montmorency County, on the way to Jack’s Landing and Fletcher Pond, is as good a place as any to get an eyeful of these beauties. This chicken, which seems to be made of fiberglass, sits in someone’s front yard. It is about ten feet tall. We have no idea why it’s there. There are no eggs for sale. And it’s not a farm. 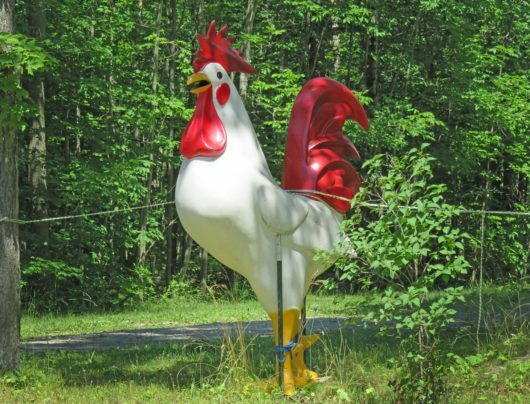 But some people mark their spot with tidy signs like “Bucky & Deb’s.” Some people name their spot with signs like “Harry’s Haven.” And some people have giant chickens. A big painted pike is one-half of the piscine pair that hang over the road and welcome resort visitors. And that’s Fletcher Pond in the background. 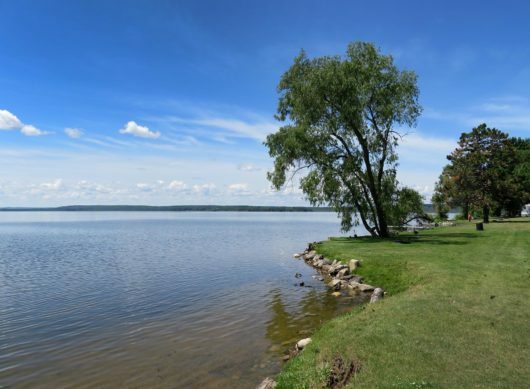 Fletcher Pond is the 11th largest inland lake in Michigan, measured by surface acreage. The Alpena Power Company dammed the Thunder Bay River in 1931 to reserve water for its hydroelectric plant. The result is a 9000 acre flooding, complete with about 13 islands. It makes wonderful quiet nesting grounds for a variety of birds, including osprey. And did I mention the bass and pike yet? The bass are so plentiful in this lake that they practically just jump in your boat. We went there once to fish. They didn’t jump in our boat. They just jumped all around us and did the fishlips equivalent of “na, na, na, na, na.” They catch monster pike here, including through the ice. The food is homestyle and familiarly good. Service is always very friendly. Pick a seat next to one of the windows with a bird feeder and be entertained by purple finches and hummingbirds. 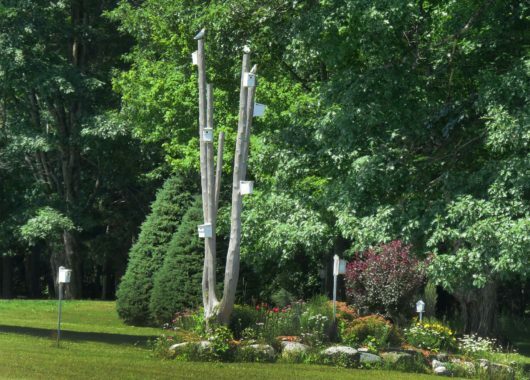 That’s a busy purple martin house atop the pole by the electrical boxes. The adults were flying over the pond, snatching bugs, and bringing them home to the young. There’s a small campground and a few cabins to rent. This is the view looking toward the row of cabins. There are places to lay your head. A well-stocked bait shop. And a place to clean all the fish you’ll catch (we won’t catch any, but you will). 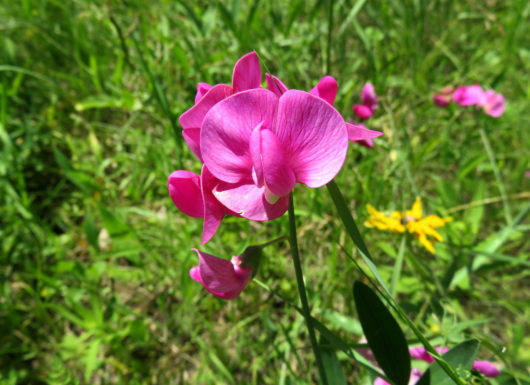 This entry was posted in Long Lake activities, Long Lake Flora, Michigan's "Up North" and tagged Everlasting Pea, Fletcher Pond, Hydrogen sulfide, Jack's Landing, Old Orange Daylily, Perennial Pea, Photos by Steve Thorpe by Noreen. Bookmark the permalink. What a lovely tour. So refreshing. 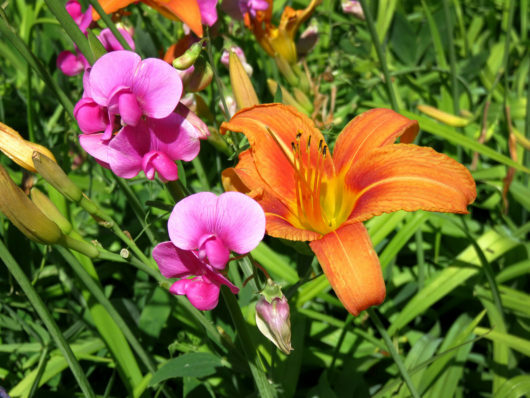 So Michigan, especially the sweet peas and the lilies which are abundant this time of year. @Dot…thanks so much for visiting the blog. Steve’s photos really do make the “tour” in my opinion. He makes it easy to write up. I revisited Jacks landing last summer 2016. After 34 years. To my surprise still had that family welcome. Yet offering a great fishing experience for the men. 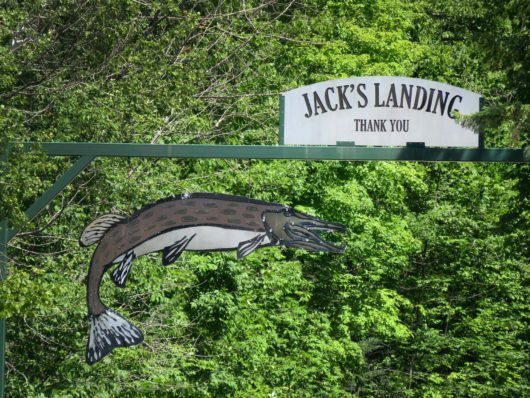 I have very great memories of Jacks landing. Back in 1975 to 1982. Jacks landing was the playground to 4 young kids. We owned property 2 doors down. And all most every weekend Jacks landing let us hang out there. Even though we weren’t guests. They welcomed us to use the pool.table. play the juke box. And play all day on the playground equipment they had. With my visit in 2016 I give them five stars. For not losing sight of what makes Jacks landing. A place a family to go and all enjoy the great experience that I know so many have gotten too. As I did. As I came acros’s this blog. It’s so nice to find others who find this quite little spot in michigan and cherish the moment. And share .. thank you so much. @Shawn…what great memories! Thanks so much for visiting my blog and commenting. 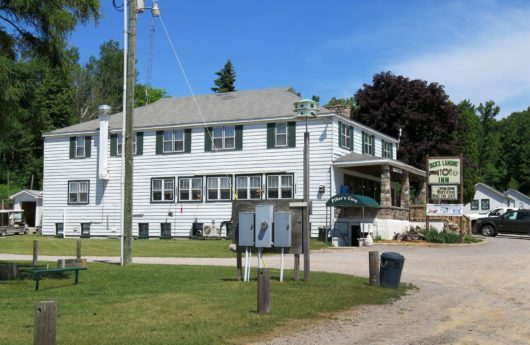 Jack’s Landing is a wonderful example of upnorth sunrise-side style!